Have you ever looked at a fossilized bone, then at a colorful mural depicting the diversity of prehistoric life and wondered how scientists get from one to the other? Julius Csotonyi – and many other paleoartists like him – work with scientists and information from their latest discoveries to bring fossils to life for visitors to museums around the world. Csotonyi created the stunning mural on display in Dinosaur Mummy CSI: Cretaceous Science Investigation – a work of paleoart that presents a vivid look into the life of Leonardo, a brachylophosaurus who died, mummified, fossilized and – 77 million years later – gives us an unprecedented peek into what made dinosaurs like Leonardo work. Here, Csotonyi shares how he created this gorgeous work of science-art. An occasional quasi-reptilian hiss of foam and the primordial roar of the bean grinder punctuate the constant brewing of conversation and coffee. The sounds of the cafe form a stimulating sonic backdrop to the dance of stylus on drawing tablet as the digital portrayal of a prehistoric landscape slowly takes shape on the glowing LCD display in front of me. The life of a paleoartist has changed a lot since the days when Rudolph Zallinger slaved away for years on his monumental “Age of Reptiles” mural on 110 feet of wall space in the Yale Peabody Museum. It all begins with a rough sketch. No, back up. It all begins with the team member of a paleontological dig spotting a fossilized bone sticking out of the ground. Fast-forward through the veritable blood, sweat and tears of painstaking work to recover and prepare the marvellously preserved fossil, which yields a boon of information. Next comes the time to share the exciting discovery with the rest of the world; in this case, in the form of a special exhibit at the Houston Museum of Natural Science. Enter the paleoartist (a term coined by paleoartist Mark Hallett to describe an artist who specializes in restoring prehistoric organisms.) Although the displayed fossil will certainly speak for itself (in the “oohs” and “ahs” of entranced museum visitors,) it is my job to help fill in patrons’ imaginations of what it may have been like to stand on Montana’s floodplains 77-incomprehensible-million summers ago to gaze at a landscape no human being will ever be able to photograph. As a dinosaur enthusiast, I am awed by the thought of the sight: huge birdlike reptiles ambling along the hot, humid riverine landscape amid stands of redwood-like trees and fern thickets, stalked by stealthy bipedal predators, barely glimpsed as fleeting wraiths in the shadows. My intent is to try to open as realistic a portal as possible to such a vista. This effort requires keen attention to detail and close collaboration with scientists, museum exhibit designers and project managers. Far from simple guesswork and reliance on imagination, the process of creating a scientifically accurate mural for a museum involves not only artistic skill but also interdisciplinary cooperation. On this whirlwind tour of such a project, I will therefore gloss over most of the artistic techniques involved, and focus instead mainly on the process of incorporating scientific knowledge into the artistic endeavour. To the drawing board, then. I began with discussions with Joe Iacuzzo (Leonardo Project manager with the Judith River Foundation) and Lex Vanderende (exhibit designer at the Houston Museum of Natural Science) who outlined what they had in mind for the layout and content of the exhibit: the number of illustrations, their preliminary sizes and their general foci. Their experience and advice were invaluable to help me plan out images that will capture people’s interest. A paleoartist must use reliable reference material for their restorations. 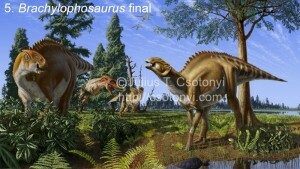 Therefore, I first read scientific articles on the animals, plants and geography that a time travellor would encounter if they were to visit the Campanian (a time period during the late Cretaceous) in Montana, where Leonardo, the Brachylophosaurus that is the star of the show, was found. Several search engines exist for obtaining scientific publications; although many are accessible mainly through university library systems, a reasonably good one that is available to the general public is Scirus. One can direct it to search only within journal articles, several of which are available freely on the web. Numerous emails and telephone conversations with experts such as David Trexler (paleontologist with Montana’s new Great Plains Dinosaur Museum) and Dr. Bob Bakker (Curator of Paleontology at the Houston Museum of Natural Science) were invaluable, for they helped complement my knowledge with relevant paleontology, and they shared exciting new research results. Visits to museums such as the Royal Tyrrell Museum of Palaeontology to observe articulated skeletons of relevant species from various angles also helped. My scientific background came in handy during image planning. I am trained as an ecologist, one who studies how animals, plants and microorganisms interact with each other and with their environment. This background helped me to plan the layout of the mural in order to maximize its educational value by illustrating numerous ecological concepts. Although my role in this project is principally as an artist, I also helped to write the museum’s interpretive text for the illustrations. Now that I had a mental image of the environment that I wished to restore, I drew rough sketches of the proposed layout for each illustration. These sketches showed just the planned positions and poses of animals and plants. 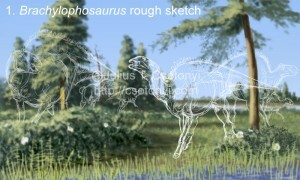 Computer technology greatly facilitated the creation of these rough sketches, as well as the subsequent tennis match of review-and-revision that ensued between the paleontological experts and me as the roughs were perfected. I created all of my work digitally using a stylus and drawing tablet connected to a computer that runs graphics programs. In this way, revisions were easy to make, which greatly sped up the process. I posted revised images daily on my website, on a special page accessible only to exhibit team members, and this precluded the need to actually shuttle back and forth between the experts. It also allowed them to conduct their reviews of my work within their own schedules. Once the layout of the rough sketch was finalized, I began the process of rendering the images in full detail. Anatomical accuracy was paramount. I began with a carefully proportioned drawing of the skeleton of a dinosaur (e.g. 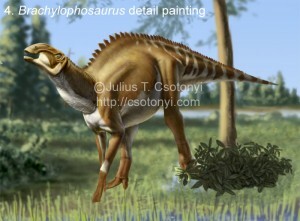 the Brachylophosaurus, illustrated here), which was based on reconstructions of dinosaur skeletons by palaeontologists. 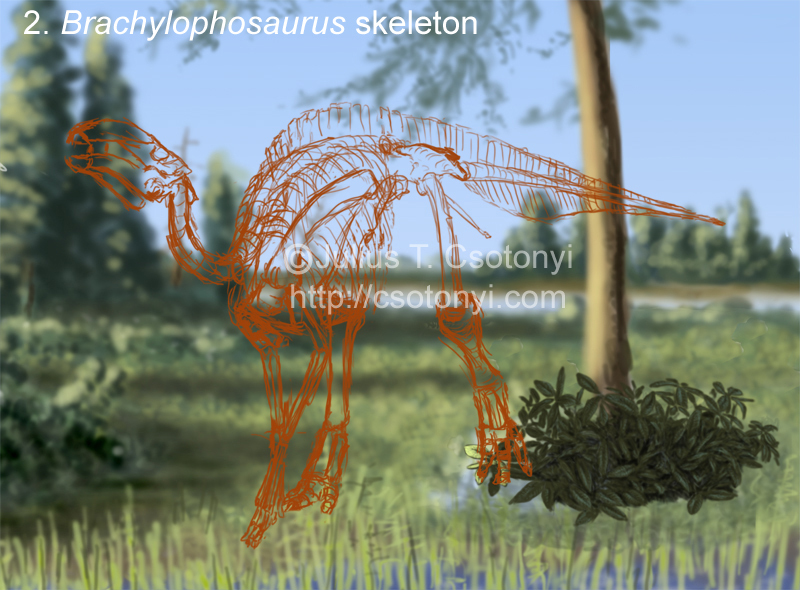 I then fleshed out the skeleton, outlining the body’s shape as defined by organs and muscles. How do I decide where to place dinosaur muscles and what shapes to draw them? Palaeontologists decipher the scars on dinosaur bones to interpret where and how many muscles were attached to those bones, while comparisons with the muscular systems of living animals suggest how those muscles likely pulled bones against each other to allow the animals to move. Published scientific articles helped, but palaeontologists involved in the project also created custom sketches of inferred muscle configurations for me to use as reference, based on the most up-to-date research, ensuring that accuracy is maintained to the best of current knowledge. Also, the mummified dinosaur in this exhibit, nicknamed “Leonardo,” is so complete that some of its muscles are actually preserved in full relief, making their restoration even easier. 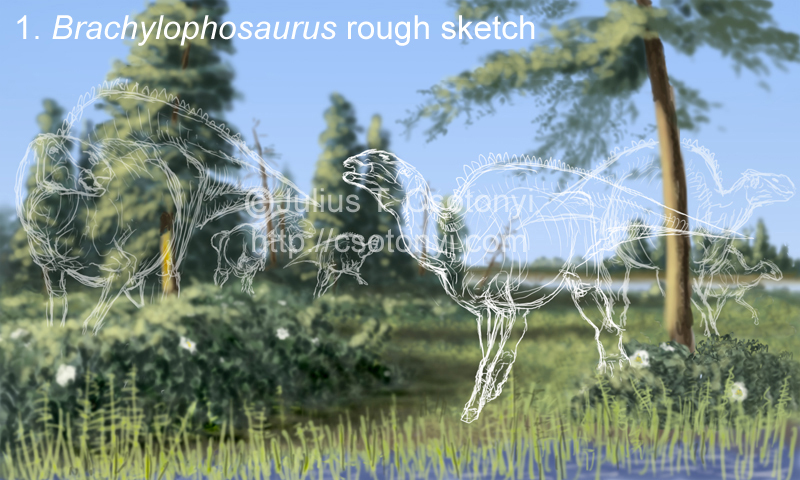 After delineating the musculature, I painted in the dinosaur’s skin. The exciting thing about a fossil such as Leonardo, the Brachylophosaurus at the heart of the Dinosaur Mummy CSI exhibit is the superior level of its skin preservation – nearly 90% of its skin texture is fossilized, for which it holds a Guinness World Record! This allowed me to accurately depict the different textures of scaly integument on each part of its body. Because I painted each and every scale, the process was quite time-consuming and required considerable patience. Lots of coffee on hand also helped, for which I thank the talented baristas of my local cafe on Corydon Avenue! It is just as important to accurately portray the vegetation and landscape in a mural as it is the animals. I needed to be careful to depict only the groups of plants that palaeobotanists (scientists who study plants from extinct ecosystems) have found in the relevant geological formations. For example, I avoided including anachronisms such as lawns of grass; terrestrial grasses appear to not have yet evolved in North America 77 million years ago, and the land was instead dominated by ferns, horsetails, conifers and other relatively primitive plants and also a few early flowering plants such as magnolias. However, reed-like plants did inhabit waterways. So it is important to exercise care not only in the types of organisms to include in an illustration, but also in their placement within the landscape. So much is known about the plants, animals and landscapes of this prehistoric setting that I could visually reconstruct the ecosystem with considerable confidence. Indeed, with the wealth of knowledge that palaeontologists and palaeobotanists communicate to paleoartists these days, we see increasingly careful attention to detail toward placing dinosaurs into their correct ecological contexts. Finally, one of the greatest benefits of digital media in paleoart today is that it allows the creation of images with a truly photorealistic feel, bridging the gap between imagination and reality more completely than ever before. Furthermore, the completion of a 64-foot-long museum-quality mural in only a few months was only possible because of the high efficiency of techniques such as photographic compositing. To create the main outer chamber mural with a photo-realistic feel, I packed up my digital SLR camera and travelled to places with appropriate plant species and landscapes, such as estuaries (where rivers meet the ocean, e.g. Cowichan Bay) and humid forests (e.g. Cathedral Grove). From the thousands of photos that I shot (under appropriate lighting conditions, I had planned out in the rough sketch) I extracted the necessary components, such as plants, and combined them in new ways that were consistent with Leonardo’s landscape. Although not all the plant species are exactly the same as existed in the Mesozoic, I still took care to keep the major groups (e.g. ferns) correct. In some cases, even the genus of a plant was accurate (e.g. Metasequoia, the dawn redwood, the dominant tree in Leonardo’s habitat). Once the landscape was thus prepared, dinosaurs were added by a combination of painting and compositing. Throughout the painting and photographic compositing process, I was continually open to palaeontologists’ suggestions for revision. The end result is a painting that comes as close to restoring an ancient environment as it is currently possible. The digital medium in which I created it also ensures that the image may be easily updated as new information outdates some aspects of it. This would have been more difficult to do with traditional (non-digital) illustration techniques. In the meantime, I hope that visitors to the HMNS will enjoy the exhibit! 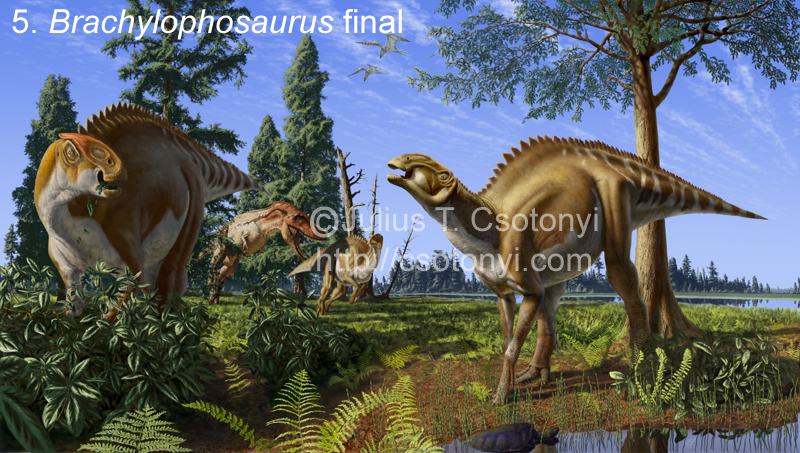 Julius T. Csotonyi is a paleoartist and wildlife artist with an incurable enthusiasm for dinosaurs. Working closely with paleontologists, he has created the murals for the current HMNS special exhibit, “Dinosaur Mummy CSI: Cretaceous Science Investigation.” He has also produced work for several museums, such as the Royal Tyrrell Museum of Palaeontology, and publishers, such as the National Geographic Society. He maintains an online gallery of his work. Julius is also trained as a scientist, with a M.Sc. in Ecology and Environmental Biology, and is currently completing a Ph.D. in Microbiology. When he is not illustrating wildlife, he now researches and lectures about the ecology and physiology of bacteria from weird and wonderful places such as deep ocean hydrothermal vents and colorful terrestrial springs twice as salty as the ocean. In this blog, he describes how he incorporated scientific knowledge into the creation of the HMNS exhibit illustrations. Great article! I get to see Julius create first hand here on Corydon Ave in Winnipeg, and it is every bit as impressive to witness as it sounds in print. Julius, you’re a true genius. Great article Steven! – The mural is very amazing – It was a thrill to get to see it at HMNS. Thank you Julius! !